Hi there! This is the 7th Nail Of The Day post this week, so Nail Week is now over! 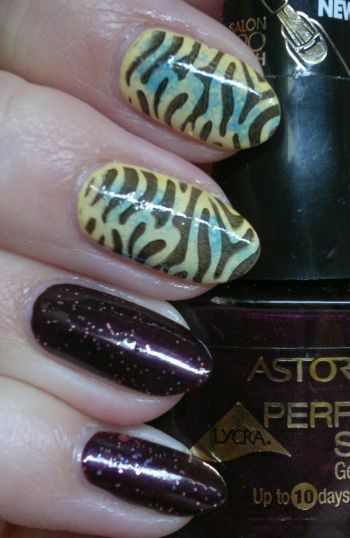 For this mani I painted my nails with Astor Perfect Stay Gel Shine 604 Just Fabulous (pinkies, ring fingers, 2 coats) and Rimmel 60 Seconds 507 Round And Round In Circles (middle and index fingers, thumbs, 2 coats). To be honest, the yellow polish could have used another coat, but instead of that I decided to use a random light blue(ish) polish and a small piece of a sponge to add a few blobs of colour. Then I used Revlon Shining Strength (a.k.a. Revlon 261 Sparkling) to add some sparkle to the ring fingers and pinkies. And I used Pueen‘s 83 plate (which is part of Pueen’s Buffet Leisure collection) and Rimmel 60 Seconds 820 Hot Black To Go for the images. so pretty! I love this print!